Music can be an incredibly powerful and productive tool, not only for entertainment but also for education and enrichment. Children love listening to music just as much as their adult counterparts, but devices geared toward the older crowd may not be appropriate for the younger set. Shopping for a music device for kids can be a daunting task, but there are many fantastic MP3 players for kids that make listening to music at home or on the go easy. Awarded Best in Family Tech in 2018 from CES, a part of the Consumer Technology Association, this is more than a children's MP3 player. 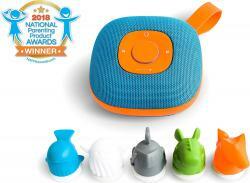 Jooki is an innovative interactive smart player that is made like an MP3 player with speakers built in for kids. It functions as both a Bluetooth speaker and an MP3 player. If you plan to use it like an MP3 player, you'll need to buy a separate microSD card. Kids change between songs and books by placing Jooki toy figurines on the button pad and each character is linked to a specific playlist. You can stream Spotify or play MP3s. Volume is controlled by the parent. It's splash-proof and durable for carrying. 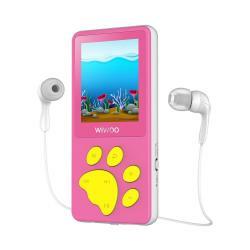 Younger kids who don't mind an MP3 player that looks like it's made for kids will love the simplicity of the Wiwoo 8GB MP3 player. Amazon reviewers give it 5 out of 5 stars for value and ease of use, making it one of the best music players for kids. If you're looking for toddler MP3 players, this one only costs about $30 and has all the features toddlers and preschoolers want. An elongated rectangle design makes it easy to hold. Simple navigation buttons are displayed in the fun shape of a bear paw. It holds a good variety of formats and includes a few games. The handy lock feature makes it so kids won't need your help listening to music after you get it started. A sturdy ABS plastic housing encases the whole thing. Bright, contrasting color combinations like blue/yellow, green/red and red/white Christmas versions, pink/yellow, aqua/yellow birthday version make it appealing to every kid. 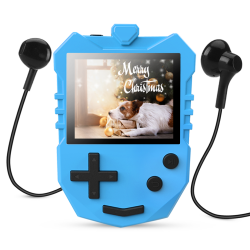 Parents and older kids will love the retro look of this little 8GB MP3 player that resembles an old Gameboy handheld video game. The AGPTEK MP3 Player for Kids is also ultra-affordable at only about $35. You choose from five fun colors: black, blue, red, yellow, and rose gold. A volume limit and brightness setting help protect kids' sensitive ears and eyes. Multiple formats including books and music are supported. Puzzle games and other tools like an alarm clock are included. The resume playback and bookmark buttons start up where kids left off. While this is certainly a music player that is perfectly suited for older children, teenagers and adults alike, it also has some great features that make it well-suited for kids. The 16GB version costs just under $60 and The Wire Cutter named it the Best Cheap MP3 Player of 2018. The large LCD display features large icons and an easy-to-read menu. The SanDisk Clip Sport Plus comes with up to 16GB of onboard storage. There are straightforward controls on the front. It comes in your choice of four bright colors like neon green, blue, pink, and red. There is a wide range of file formats supported. As the name implies, it comes with a wearable clip for added convenience. This means that little Jenny can easily clip this music player to her pants or coat for hands-free musical enjoyment. Its rubbery exterior is water resistant and built to withstand more of the daily abuse from a child. Sony Walkmans have been part of the portable music scene for decades. 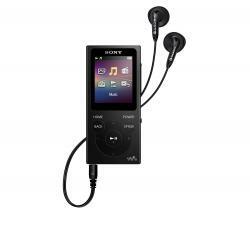 The Walkman NW-E394 8GB MP3 player has that elongated rectangle shape that makes it easier for little hands to hold. Ninety percent of Best Buy customers would recommend this model to a friend. For around $60 it has the look older kids will want without all the capabilities parents worry about. Choose from a cool metallic finish in black or red. Each button is clearly labeled with directive words. You can only play music and displays images. The battery lasts up to 35 hours. Weighing in at only about 1 ounce, it's light enough for kids to take anywhere. 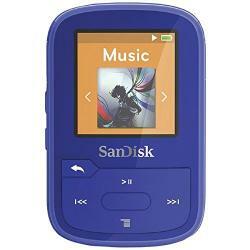 There are many factors to consider when buying an MP3 player for a young child. Durability: As with all other children's toys, the kid-friendly MP3 player should be built to withstand some level of physical abuse. Design: MP3 players that feature bright colors or the child's favorite characters can be a big plus in terms of aesthetic appeal. Sound: According to doctors, it is very easy for earphones to reach a level of sound (70-90dB) that causes irreversible hearing damage. There are some music players that restrict volume to prevent hurting those little ears. Compatibility: All MP3 players should be able to handle conventional MP3 files without too much trouble, but if having support for additional formats like AAC and AIFF are important to you, then you should ensure the chosen player supports these formats. It used to be the case that children's toys were oftentimes simplified or dumbed-down versions of their adult counterparts. However, the tech-savvy generation demands highly functional equipment with the extra 'cool' factor. Whether you have a girl or a boy, MP3 player choices are plentiful. When looking for the best MP3 player for kids, consider the features of different models to find one your child will love.